If Timmy throws a ball from his front yard in Boston towards the Equator in a straight line heading south, in what country will the ball end up? Pull out your map and look at the country that is on the Equator directly south of Boston. The answer is Columbia, right? The question seems simple; a map and a ruler should be all we need to answer it upon first glance. However, there is something else happening to the ball once Timmy throws it that makes the answer a bit more complicated. It is called the Coriolis Effect. The Coriolis Effect describes the way objects passing over the Earth respond to the Earth’s rotation. Since the Earth rotates as a whole, the speed of rotation at the Equator is faster than that at the poles. The combination of atmospheric convection currents with the Coriolis Effect create high and low pressure systems called Hadley, Polar, and Ferrel Cells. Earth’s air is pushed and pulled through these systems due to the four major properties of air: density, water vapor capacity, adiabatic healing and cooling, and latent heat release. Objects travelling over the Earth’s surface also appear to become displaced, such as Timmy’s ball. However, Timmy’s ball is actually still moving in a straight line, while the Earth rotates under it. So instead of landing at the end of a straight line south, Timmy’s ball would actually appear curve along the surface of the Earth and end up somewhere in the Pacific Ocean. The ball is thrown in a straight line, but the Earth rotates beneath it. 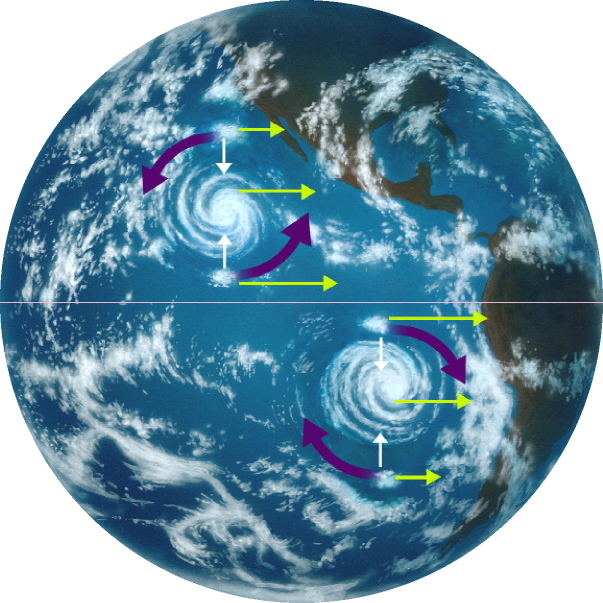 The Coriolis Effect also has an impact on large scale storms, such as hurricanes. The air in a hurricane is transformed into the telltale whirlpool image through high- and low-pressure systems created by the Coriolis Effect. High speed rotation at the Equator pushes the air towards the poles, then the low pressure at the Equator draws the air back in. Hurricane air systems are formed by air pushed from the more rapidly rotating Equator towards the poles. However, Earth is not the only planet that experiences the Coriolis Effect. Jupiter, in particular, has an incredibly strong Coriolis Effect due to its immense size and high speed rotation. Since Jupiter has the fastest rotation in the solar system, the force Jupiter’s Coriolis Effect is magnified. It does not have three cells of high and low pressure systems like Earth. Instead, it has bands of air that whip around its surface, creating the striped look that can be seen from outer space. Jupiter’s Great Red Spot has recently been shrinking. Like Earth, Jupiter’s Coriolis Effect impacts storms. Jupiter’s Great Red Spot, for example, is directly at the point at which two of Jupiter’s air bands meet, creating a pressure system so great that the Great Red Spot was approximately three times larger than Earth at its largest. 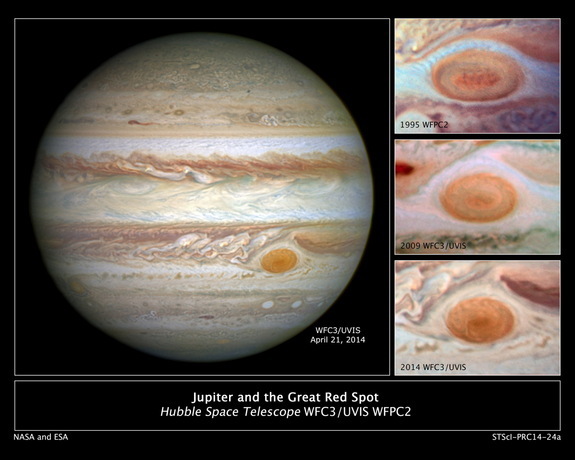 Recently, however, the Great Red Spot has been shrinking. Now, it is only about the size of one Earth. One hypothesis is that some activity in Jupiter’s atmosphere is drawing energy away from the storm. I think it could potentially be due to a shift in Jupiter’s Coriolis Effect, which would interfere with the meeting place between the bands of high pressure air that caused the Great Red Spot in the first place. However, scientists are not sure why it is shrinking. The Coriolis Effect impacts so many different things in our universe: storms, air patterns, convection currents, airplanes, missiles, and even rockets, not just on Earth but on other planets as well. Erica, great post! You have helped me understand the Coriolis effect a lot better by writing this. I did not really know that the movement of hurricanes had anything to do with the Coriolis effect. It is interesting to think that the Coriolis effect affects things like hurricanes to air travel. Do you know if there is anything else that the the Coriolis effect has major influence on? I loved reading this article because it helped my understanding of the topics covered in this unit. Keep up the good work. The beginning of this blog post made me laugh and want to keep reading. Great job! I find that so interesting that you think Jupiter may have a shifting Coriolis Effect, do you think it will create another Great Red Spot somewhere else on the planet? If it’s just shifting would that happen? Or would the air bands not meet that way again… In general I think this is a great entry, you do a good job explaining the Coriolis Effect to a point where I have a better understanding of it. I think you did a great job writing this blog post because you started it off by really getting the readers attention. Furthermore, I thought you did a really great job connecting a concept that we had already learned about to something that was completely foreign and totally interesting. It’s weird to think about other planets, but your blog post really made me think about it and I have some questions. My biggest one however is if you think that something like this will happen again at another spot and whether you think this is happening on other planets. Again, great blog post. It was super interesting and you did a great job writing it.